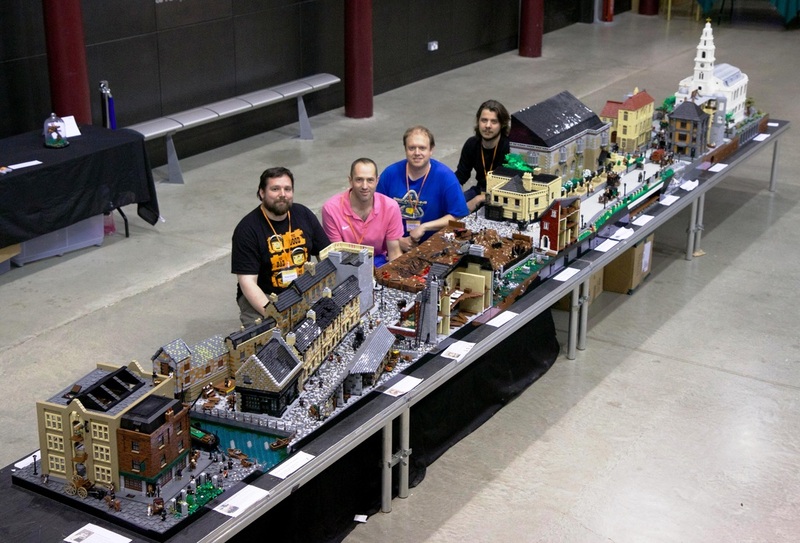 In 2014 a reduced team of just James Pegrum, Jimmy Clinch , Steve Snasdell and new member Simon Pickard took on the grimy streets of Victorian London. We found this a very rich subject and were almost spoilt for choice on what to include. 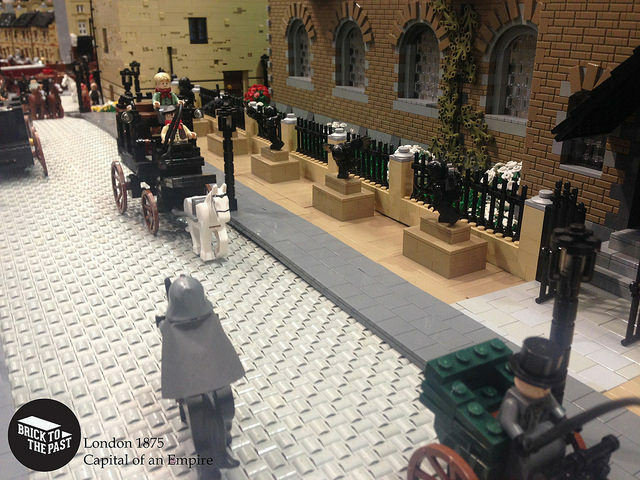 Early on we realised that a key aspect of this theme was how Victorian London was a city of great contrast. 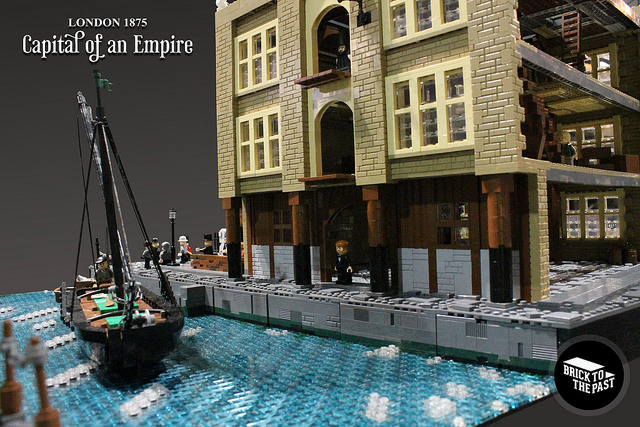 At first glance there was the incredible wealth and innovation of the British Empire bringing about the industrial revolution. But there was a harsher side with the majority of Londoner's being destitute. It was a period that saw the start of the modern world, with innovations like clean drinking water and the seeds of a ‘cradle to grave’ social care system. In order to capture this contrast we decided early on to split into pairs. Steve and James concentrated on the working and begging classes of the East end. Jimmy and Simon focused on the middle and upper class areas, concentrated mainly in the City and West. 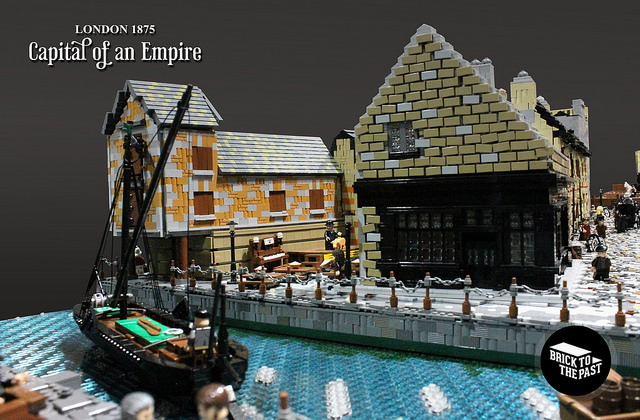 It was decided that we could get a lot more history in, if geographical accuracy was sacrificed. Another interesting challenge came in the form of our base height. 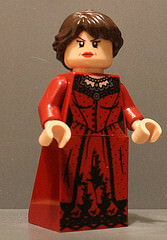 When dealing with large scale LEGO models it is preferred to keep the base height low. However, we had a very good reason to break this rule, as we felt we had to include the world’s first underground railway. 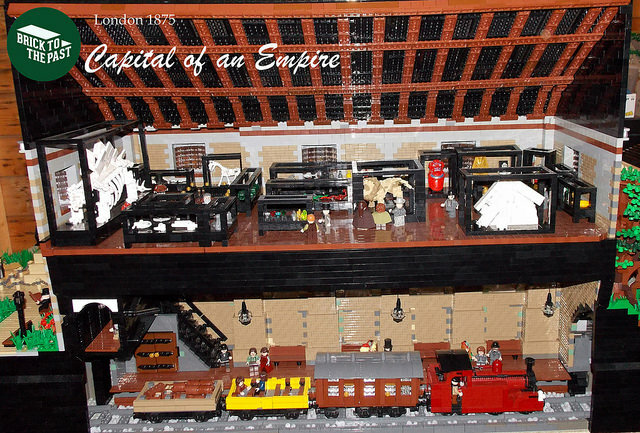 In order to accommodate a running train underneath, we had to elevate the ground level to around fifteen bricks high. We felt that after going to go to all this effort it was important to take the opportunity to include much more of underground London, such as sewer tunnels, bank vaults, crypts and archaeological remains. 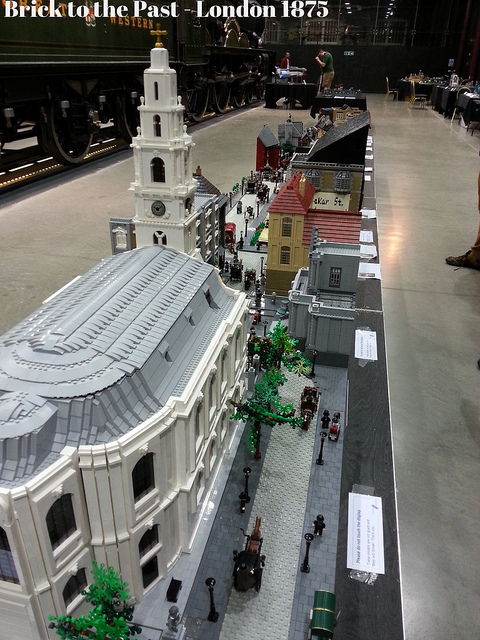 The result was a long strip of Victorian history incorporating many of the key London institutions and areas. 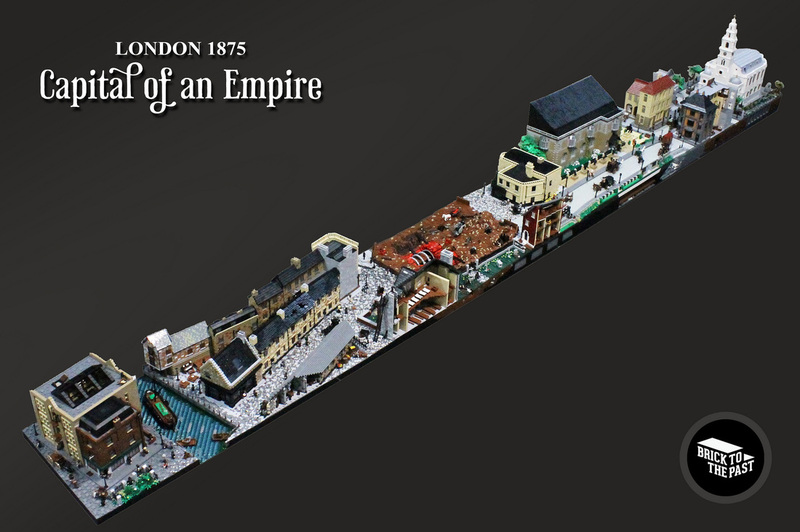 The London Docklands at this time were packed with goods from all over the Empire. Steve captured this with a typical Shad Thames warehouse complete with loading cranes, dock workers and an accurately rendered Thames barge. 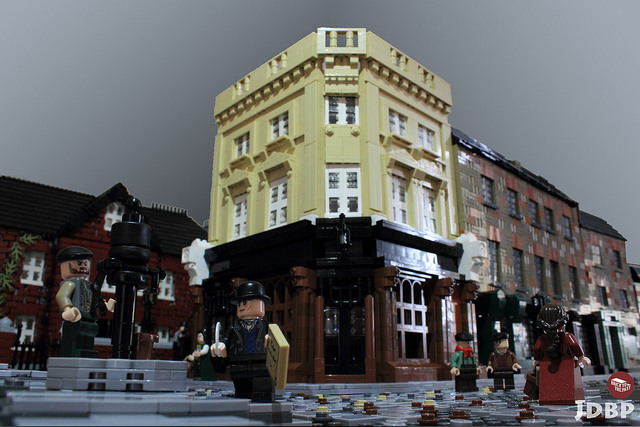 His East End boozer used LEGO plates and tiles in the various brown colours, to achieve his brick built effect. James started from the other side of the water with Mrs Lovett’s pie shop and dilapidated rows of terraced housing. In the alleyway between he staged a pig singing contest, which was one of the quirkier items that turned up in our historical research. 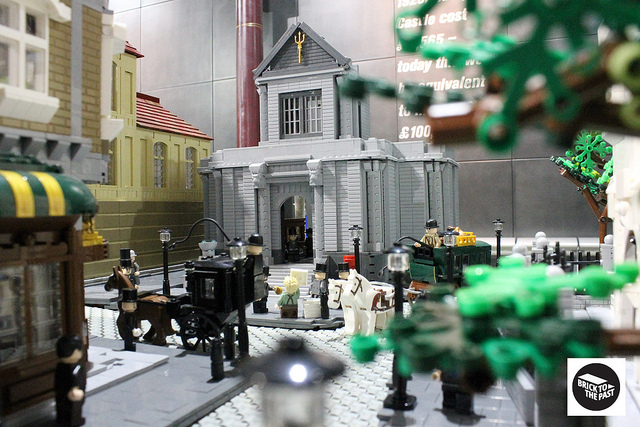 He also added a Georgian style pub and a workhouse showing the famous ‘can I have some more’ scene from Oliver Twist. Broad Street (now Broadwick Street), Soho, London. 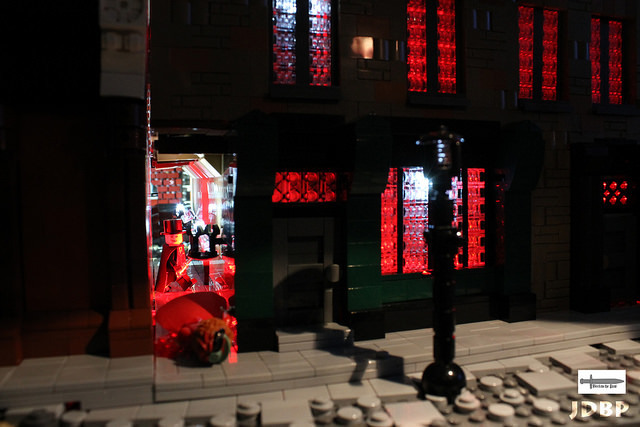 Elements of Whitechapel were added with a build based on the Ten Bells Pub complete with a mysterious Jack the Ripper figure lurking in the shadows of a nearby alleyway. The next section showed the ‘cut and cover’ method of tube tunnel construction. 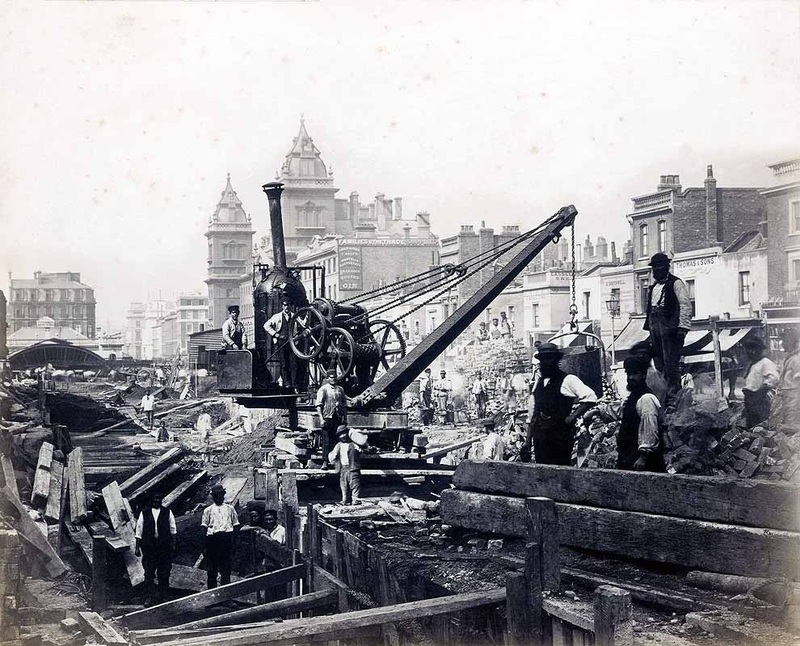 By marring the working navvies to the expanding tube system, it helpfully tied the two halves of our London together. James constructed the scene from a photograph displayed in the London Transport Museum. 1868AD, South Kensington, London. 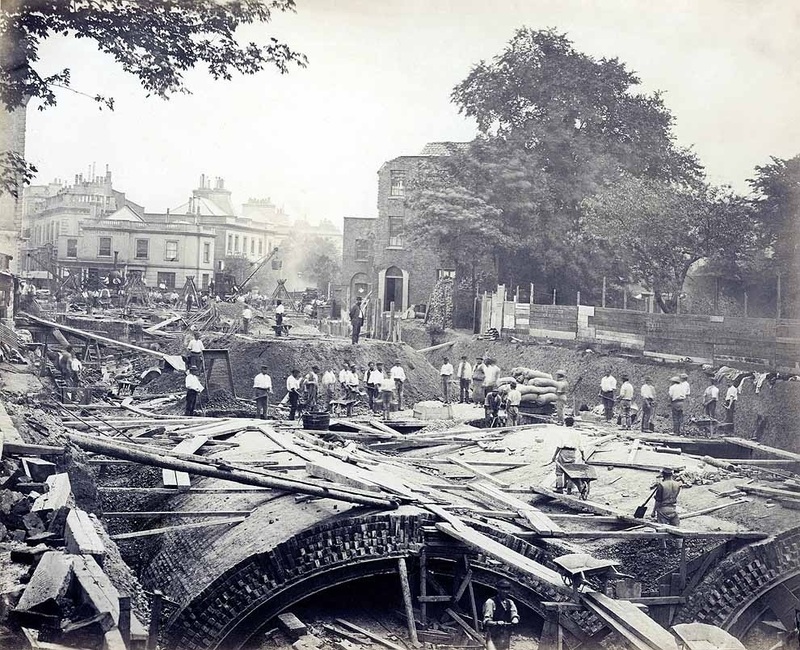 Construction work on the Metropolitan District Railway takes place. Inspiration from our tunnel construction. 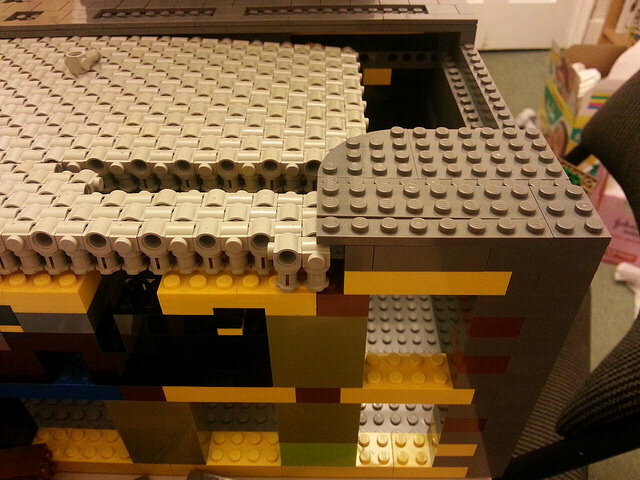 Simon took on the task of the underground by constructing a partial replica of the first Baker Street platforms. Complete with vaulted roof and an early metropolitan steam train, as used in the recent 150th celebrations of the underground network. He contained the top half of the station into a museum building which allowed him to cut down on the ground level height needed for the vaulted roof. 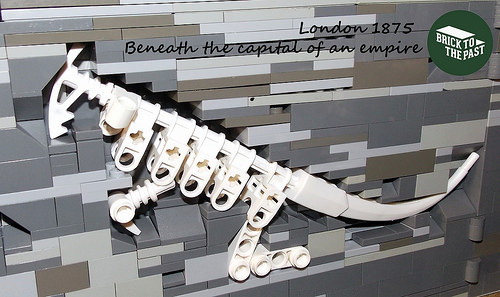 He filled his museum with objects inspired by the displays at the National History Museum. Jimmy’s section aimed to display the riches of London with a high end department store and a bank. The department store used elements of both the Harrods and Fortnum and Mason buildings. The bank was inspired by the architecture of the Bank of England. The newspaper office, complete with printing press was modelled on the old Daily Telegraph building in Fleet Street. 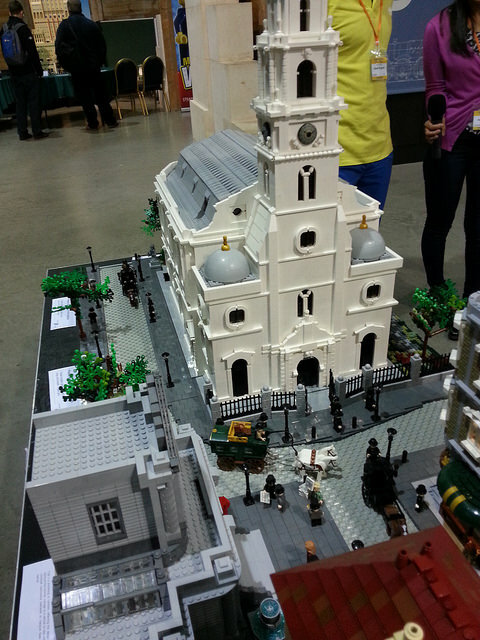 Finally at the top of the display sits St Clement Danes. Early into the build the group discussed the roads to ensure a smooth transition throughout the model, particularly needed for the wealthier end of London. More than 10,000 Technic connectors were employed to render the main road. The road as part of the model. A new innovation this year was a ‘can you spot’ sheet. 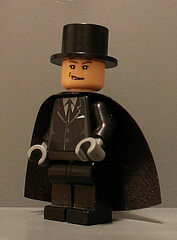 A range of characters from history, period literature and figures for which we created our own back stories for. These were used to highlight key features in the model and proved popular with many children and adults happy to play the game. Some of the characters we included were: Charles Darwin, Octavia Hill, Dr John Snow, Joseph Bazalgette, Charles Dickens, The Elephant Man*, H. G. Wells* and Sherlock Holmes. *These figures were courtesy of our friend Peter Reid, who loaned them to us for the display. The team, from left to right: Simon Pickard, James Pegrum, Jimmy Clinch and Steve Snasdell. 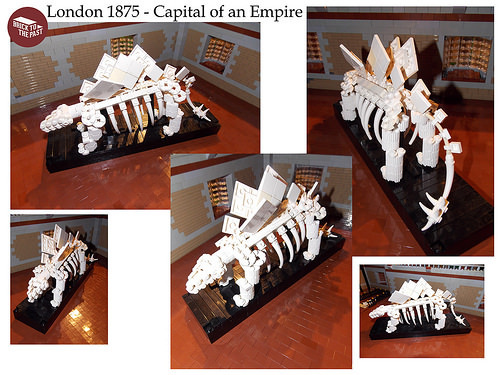 Like most of our large models, London 1875 only existed as a whole during the year of its creation. However elements of it remain extant and are still available to rent. Contact us for more information.